Captain Eugene Ray Martin’s new book “UNITED STATES SHIP TEXAS: THE EL DORADO ADVENTURE” is an engrossing page turner about war, strategy, and decisiveness. 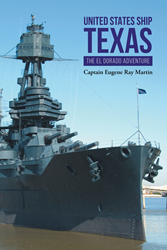 Recent release “UNITED STATES SHIP TEXAS: THE EL DORADO ADVENTURE” from Page Publishing author Captain Eugene Ray Martin is the enthralling journey of a ship and its crew tasked with a very important mission on American territory. Captain Eugene Ray Martin, a former US Navy who later became a merchant mariner and is qualified to command sailing vessels, motor vessels, and tugboats, has completed his new book “UNITED STATES SHIP TEXAS: THE EL DORADO ADVENTURE”: a fantastic account of how Americans dealt with the looming war and struggle for power. Published by New York City-based Page Publishing, Captain Eugene Ray Martin’s gripping novel tells the story of struggle, determination, and honor of serving one’s country with pride, especially during times of national crisis. Readers who wish to experience this amazing work can purchase “UNITED STATES SHIP TEXAS: THE EL DORADO ADVENTURE” at bookstores everywhere, or online at the Apple iTunes store, Amazon, Google Play, Kobo or Barnes and Noble. For additional information or media inquiries, contact Page Publishing at 866-315- 2708.